If you are interested in coaching at the Bavarian Soccer Club, please contact Bob Spielmann, Director of Coaching. Bavarian: Coach Spielmann is entering his 4th year as the Director of Coaching, capping a long road back to the club in which he grew up and began his coaching career. This is Coach Spielmann's 22nd year coaching at BSC. Coach: He returns home from the Elm Grove Soccer Club where he served as Director of Coaching for the past 5 years. Prior to Elm Grove, Spielmann spent 2 seasons as Associate Head Soccer Coach at UW-Milwaukee. He went to UWM from Marquette University High School, where he spent 27 seasons as head coach. He turned MUHS into one of the nation's premier soccer programs, compiling a 532-73-40 career record while claiming 20 Division 1 State Championships, including 10 consecutive State Championships. He was the first coach ever to lead a team to 4 consecutive State Championships when the WIAA and WISAA combined. In addition, the Hilltoppers earned 4 State Runner-up honors and 21 Conference Championships during his tenure. The MUHS teams were ranked among the nation's top 25 teams in the NSCAA High School rankings every year from 1995 - 2005. Coach Spielmann helped develop 22 High School All-Americans. In addition he served as Head Coach of the Divine Savior Holy Angels High School program from 1998 - 2002 where they were Greater Metro Conference Champions 1998-99, WISAA State Runner-Up 1998-2000 and WIAA State Qualifier 2002. Also coaching girls soccer at Nicolet High school from 1993-1997, Coach Spielmann was able to compile a winning record of 63-32-9 and was WIAA State Qualifier 1996 Semi Finalist. Along with his extensive experience as a clinician, Coach Spielmann has served as the assistant coach of the Milwaukee Wave United of the A-League for two yearsHis long and successful coaching career has its roots in the Bavarian Soccer Club where Coach Spielmann led the following Bavarian teams from 1978-1996 as Head Coach. Coach Spielmann is a highly regarded and decorated coach having been honored with the following awards. Coach Spielmann has a USSF "A" license. Bavarian: Tom Zaiss has coached at the Bavarians since 1996. He is a native of New York but moved to Milwaukee in 1982. He played his youth soccer with the Bavarians as well. As Bavarian Program Director, he guides high school and older players with their continued commitment to the high level competition and the technical, tactical, psychological and social aspects of the game. He focuses on getting players ready for the next level. As the Director of Operations, he works tirelessly behind the scenes to ensure all Bavarian teams are ready for competition. Player: Tom played his high school soccer at Whitefish Bay where we was an All-State 1st Team selection. He played on the Midwest regional teams from 1983-1987 playing his way to Youth National camps in 1984 and 1985. Tom took his soccer skills back to the East coast attending the University of Connecticut, graduating in 1991. Tom was an NCAA participant all 4 years at Connecticut and made the all-conference team in 1990. Coach: Tom worked with the Whitefish Bay soccer club as their Director of Coaching as well as coaching the boys and girls high school Varsity teams, taking both teams to the State Tournament. In 1996 Tom started playing and coaching for the Bavarian Major Team. In 2001 he decided to focus on coaching and was rewarded with four National championships in 2001, 2002 and 2003 twice (Amateur and Open Cup). Tom was the U.S.A.S.A. Regional Coach of the Year in 2001, 2002 and 2003 and was inducted to the Wisconsin Soccer Hall of Fame in 2006, the youngest inductee ever. Tom also was assistant coach and manager of the Bavarian 2009 National Championship Open Cup Team. Coach Zaiss has a USSF 'A' and NSCAA National Advanced Diploma. Personal: Tom lives in Mequon with his wife, Kim and 2 daughters, Ashley and Renee. Bavarian: Kyle Zenoni is the Academy Director for the Bavarian Soccer Club. Kyle will focus on the boys and girls programs from U8 to U10, as well as the Grassroots program for players aged 6 and up. Kyle will focus on encouraging the players development and love of the game in this important foundational stage. Coach: In addition, Kyle is the Men's Associate Head Coach at UW-Milwaukee where he was a 4 year starter for the Panthers. Kyle played professionally in Scotland, Sweden, Minnesota, the Premiership in Bolivia and in the Copa Libertadores (Champions League of South and Central America). Kyle has earned a reputation in the soccer community as a hardworking, smart coach that is well respected by his peers. He's worked with the Youth Development Program in Whitefish Bay, the Milwaukee Kickers, Sussex Club Soccer, the Special Olympics and as an Assistant with MATC. Coach Zenoni has a USSF License: National C.
Personal: Kyle lives in Fox Point with his wife Megan and daughters Aliyah and Audrina. 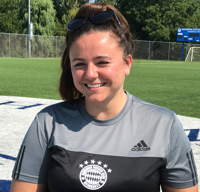 Bavarian: Coach Blanchard is in her fourth year with Bavarian. Player: Cassidy played for the University of Wisconsin - Milwaukee as a 4 year starter and 3 year team captain. She helped lead the back line as a center back and was named Horizon League Defensive Player of the Year in 2015. In her senior season she helped the team earn the second-lowest goals-against average (0.285) in the NCAA with 14 shutouts and an undefeated regular season. During the Summer Cassidy plays for various WPSL teams. In the summer of 2016 she played for the Fresno Freeze (Fresno, CA) and during the summer of 2017 she played for the TTI Bluebonnets (Houston, TX). During her time with the Bluebonnets she started as a center back and helped her team to the Regional Semi Finals (top 16 in the country). Coach: Cassidy has coached in the academy for the past 3 years. Personal: Cassidy grew up in Whitefish Bay. She is currently in her 5th and last year of college, majoring in graphic design and minoring in business. Bavarian: Coach Benn is in his 3rd with Bavarian. Player: Brian played his collegiate soccer with the Wisconsin Lutheran College Warriors. Coach: In addition to BSC, Coach Benn has also coached the Messmer High School Boys and Girls Varsity teams. Coach Benn holds his USSF National "D" license. Bavarian: Coach Campos is in his 3rd year with Bavarian. Player: Diego was a 4 year start at Concordia University. While there he was a 2-time Captain, 4-time All Conference selection, All- Region selection (SR year), Team MVP and helped the team win its first conference championship in 10 years. While at Hamilton HS, he was conference player of the year (SR year), 2-time captain and All-State selection. He is a member of the Croatian U-23 team that was runner up in this year's US Open Cup. Coach: Diego has been a coach at North Shore United for the past 4 years. In addition, he has assisted with Concordia summer camps and runs the Ozaukee HS Soccer Camp. Coach Campos holds his USSF "D" State license. Personal: Coach Campos just graduated from CUW with a degree in Accounting and works in Glendale. Bavarian: Coach Davey became a Bavarian when he started playing for the Bavarian Soccer Club in 2002. (U11-U18). He is excited to begin his coaching career for the same club that he grew up playing for. Player: Luke grew up in Whitefish Bay and played soccer for WFB High School (2006-2010). While there, Luke earned all-area and all-conference honors as a senior. He was a multi-sport athlete in high school (soccer and wrestling) and was the 2010 Scholar Athlete/Sportsman of the Year. 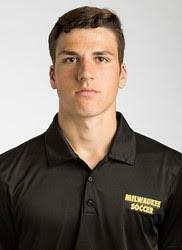 Luke played 4 years of collegiate soccer for the UW-Milwaukee. He was a member of the Panthers when the team won the Horizon League Championship and made an NCAA Tournament appearance in 2013. Personal: Coach Davey is a middle school special education teacher. He is also the head wrestling coach at Whitefish Bay Middle School. Player: Played for FC Milwaukee, then FC Wisconsin Eclipse in the ECNL. Was recruited to play for Iowa State University however Coach Donofrio decided to end her playing career due to reoccurring injuries. Coach: Coached the JV2 girls team for Oconomowoc High School in the spring of 2017. Sophia is currently obtaining her ‘E’ license then will continue towards a “D” license. Personal: Currently a psychology student at UWM, hoping to eventually earn a masters degree in either child psychology or sports psychology. Player: Daniel played club soccer at Xavier University, and played at Marquette University High School. On the club level he played for Brookfield before transferring to Elm Grove. Coach: Daniel is also an assistant Varsity coach at Brookfield Central. He currently holds his USSF 'D' License. Bavarian: Coach Grimm begins his 8th season with the BSC having worked with our Academy and Grassroots Programs since 2010. In addition, Coach Grimm also coached with the Whitefish Bay Soccer Club from 2007 to 2011. Player: In high school Steve was a 4 year letter winner at Brown Deer High School, earning All-State honors his Senior Season. Steve went on to play collegiately for the Milwaukee Panthers, where he was the team captain and MVP his senior season. Steve continues to hold the schools single season assists record. Coach: Coach Grimm holds a National "D" Coaching License. Personal: Steve is a native of Brown Deer and currently lives in Whitefish Bay with his wifed Donna and children Meghan, Ben and Patrick. Bavarian: Coach Hall begins his second year as a Bavarian Soccer Club Staff Coach. Player: He played at UW-Waukesha and St Mary's High School in Fond Du Lac. Coach: Ben has coached at Lake Country United (2007-2011), Bookfield Central Boys (2009), University School of Milwaukee Boys (2010), Sockers FC (2012), Brookfield East Girls (2016), Elm Grove (2017) and Brookfield East Boys (2018). Coach Hall holds a USSF "D" License. Personal: Coach Hall has 2 daughters: Sofia, who players for Bavarian, and Lillian. Bavarian: Coach Hodgins joined the Bavarian Soccer Club in 2012-2013 as the Head Coach of the Majors Team. Player: He played at of Lakeland College graduating in 2001-02. Coach: In addition to his experience at BSC, Coach Hodgins has also worked with the Croatian Eagles 2010-2012 where he won the WASA Reserve League championship (2011), WASA tournament championships (2010, 2012), U23 regional finalist (2011), U23 regional winner (2012), U23 National Runner up (2012) and the U20 regional winner (2010). Hodgins was also the Assistant Coach at his alma mater Lakeland College from 2003-2004. Coach Hodgins holds a USSF "D" License. Bavarian: Coach Gyuricza begins his 6th year with the Bavarian Soccer Club. Player: Ben played 4 years, three with the varsity team, at St.Viator Arlington Heights in Illinois. Coach Gyuricza played club soccer under coach Tony Keys and Eric Baumann with EG Arsenal. He continued his playing career at Concordia University Wisconsin. He currently plays with the Brewers FC Majors. Ben grew up in the northwest suburbs of Chicago and was lucky enough to play for some state's top coaches. Tony Keys (former Chicago Fire Academy Coach, Mike Taylor (founder of Soccers FC Chicago and Eric Bauman (337 college wins)]. Coach: Last year, he qualified the 03 Bavarian Boys Blue team to the Nationals League. Ben is going into his 4th year as assistant coach with Concordia University Wisconsin Men's soccer program. The first 3 years included 2 conference championships and the program's first national ranking. Coach Gyuricza holds a USSF "C" License. Personal: Ben has 2 brothers who also play soccer. One played professionally in Sweden for 2 years and they are both currently playing in college. His parents still reside in the Chicago area. Bavarian: Coach Heath in his first year with Bavarian. Player: Ryan grew up in St. Louis, MO playing for the St. Louis Scott Gallagher soccer club; Won the 1996 U18 National Championship. Played Division I soccer at Missouri State University; awarded multiple Division I scholar athlete awards. Coach: Coach Heath is working on his D license. Personal: Ryan lives in Whitefish Bay with my wife Kelly, daughter Caroline, and son Harrison. Bavarian: Coach Holowaty is in his second year with Bavarian. He has been a BSC Majors player since Fall 2014. Player: Dan played collegiately at Rochester Institute of Technology where, in 2011, his team was the NSCAA Mens's DivII All-East 2nd team. Coach Holowaty is 10th in all time scoring at RIT with 24 goals and 13 assists. He then played 2 seasons professionally in the USL-Pro with the Dayton Dutch Lions (2012) and the Pittsburgh Riverhouds (2013). Dan has also trained in the UK with League 1 side Bradford City while obtaining his MBA from Leeds Business School. Coach: In addition to BSC, Coach Benn has also a staff coach for the Dayton Dutch Lions (2012) and the Cleveland Force Academy (2012). While with the Pittsburgh Riverhounds, he was a camp instructor and conducted personal technical sessions. Bavarian: Coach Hunstiger is in his 3rd year with Bavarian. Player: Jake played collegiately for Elmhurst College in Chicago and Drake University in Des Moines, Iowa. In 2014 he started 6 games as goalkeeper for the Drake Bulldogs. Jake was a 4 year letter winner at White Bear Lake Area High School in Minnesota. He served as team captain his senior year and was awarded All-Conference honors as a Sophmore and Junior. He played his club soccer with St Croix Academy. Coach: In addition to BSC, Coach Hunstiger has been a staff coach for St Croix Soccer Club, Norwalk Soccer Club and Coerver Coaching Academy. Personal: Jake was born in Minnesota. He majored in Psychology and Neuroscience. Bavarian: Currently coach the U15 Boys fall team. Will coach the U15 Boys White team in the spring. Coached the U23 team this past summer. Player: Played at Bavarian since he was 6 years old, and won 4 youth state championships at the club. Played at MUHS and won 3 state championships in his time there. Played at Marquette University for 3 years before an injury ended my career. 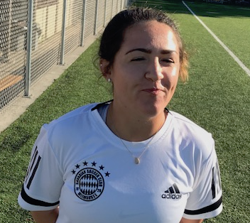 Coach: Coached the Bavarian U23s to an undefeated championships in summer of 2018. Currently the graduate assistant coach with the Wisconsin Lutheran College men's soccer team. Coach Jarosz is in the process of completing his D license. Personal: Recently graduated from Marquette University with a degree in Finance, as well as a degree in Operations and Supply Chain management. Currently pursuing a Master's in Leadership and Innovation at Wisconsin Lutheran College . Bavarian: Jake Kelderman is an Academy Coach for the U10 Pool at Bavarians, as well as the Grassroots program for players aged 6 and up. Player: Jake currently plays division I soccer at UW-Milwaukee, where he plays Center Back. He was voted onto the Horizon League All-Freshman Team in 2017. He also played at Nicolet High School, where he was named First Team All-Conference Twice. 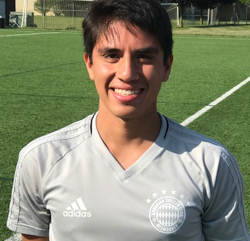 Jake has been a member of Bavarian Soccer Club since 2012, and plays for their men’s teams during summer. Coach: In addition, Jake has been a soccer coach at Bavarians since 2016. He currently holds a US Soccer National F License. Personal: Jake currently attends college at UW-Milwaukee, where he is double majoring in Finance and Marketing. Bavarian: Coach Klopp is working with our 16U boys for the 2017-2018 season having previously coached for the Bavarian Soccer club at the 12U and 19U level. Jim has played with the Bavarian Soccer Club for over 30 years and is currently playing with the BSC men's reserve team. Player: He was a 4 year varsity starter at Dominican High School in Whitefish Bay where he earned a soccer scholarship to play soccer at the UW-Milwaukee from 1988-1992. Coach: During his hiatus from BSC, Jim served as Varsity Assistant Head Coach and Head Coach at DSHA from 1995-2002. After that, he coached for the Cedarburg Soccer Club on the U12 to U15 levels from 2003-2007. Coach Klob holds a USSF 'D' coaching license. Personal: Jim resides in Glendale with his wife, Maris, children, Matthew and Sara and dog, Lambeau. Bavarian: The 2018-2019 season will be coach McKenna’s first year coaching with Bavarian.. Player: Played for FC Milwaukee, then FC Wisconsin Eclipse in the ECNL. Four year varsity soccer player for Wauwatosa East High School. Played 3 years at Concordia University. Coach: Coaches the JV team at Whitefish Bay High School and assists with the Varsity team. Six years of Coerver coaching experience. 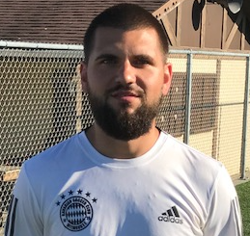 Personal: Currently a student at Concordia University studying Exercise Physiology, Graphic Design/Art and Marketing..
Bavarian: Coach Long is in his 1st year with Bavarian. Coach: Vfl Leverkusen U19's 2002-2006, 2004 Mittelrheinliga Champions and promoted to U19 Bundesliga West. Bayer 04 Leverkusen 2006 - 2014, 2007 German U19 Champions, German Cup Winners, International U19 Cup Winners, Düsseldorf. 2011 and 2012 Regionalliga West, U15 Champions, 2012 International U15 Cup Winners, Groenlo. Steve has had the pleasure of coaching the players; Leroy Sané (Man City), Benny Henrichs, Kai Havertz, Dominik Kohr (all Bayer 04), Jonas Meffert (Holsten Kiel), Jens Hegeler (Bristol City) and many more amazing talents. Coach Long holds a UEFA "B" License. Personal: Born and raised in England but at 19 moved to Leverkusen, Germany. I moved to Milwaukee in 2014 and married Angie. We live in Glendale and have together, a total of 6 children and 2 Grandchildren (with 2 more on the way). I have supported Tottenham Hotspur for 47 years and have now come to love the Packers and all the other Wisconsin teams. Player: Coach Moser played at UW-Parkside and graduated in 2012. I currently play for Bavarian Majors as well as Croatian Eagles UPSL. Coach: ICoach Moser holds his USSF "E" License. Bavarian: Coach Mroz begins his 6th season with the Bavarian Soccer Club. Player: Coach Mroz has an extensive playing career starting with Marquette University High School where he won State Championships in 1984, 1985 and 1986. Jon went on to play at UW-MIlwaukee from 1987-1991.Mroz played professionally with the Milwaukee Wave in 1992-93 and the Milwaukee Rampage in 1993. He continued his playing career with the United Serbian majors from 1987-1997. Coach: In addition to his experience with BSC, Coach Mroz has worked with various teams including the Wauwatosa West HS girls from 1985-1987, the Grafton HS girls from 1988-1990, the Wauwatosa Kicks from 1988-1992. He was an Assisstant Coach with UW-Milwaukee from 1993-1997. Prior to returning to BSC Jon worked with the Elm Grove Soccer Club from 2011-2012 and with our Bavarian Soccer Cub NPSL team in 2007 and 2008. He directed the soccer program at Brookfield Central High school for 19 seasons beginning in 1997. Coach Mroz holds a USSF "D" License. Bavarian: Julie begins her 7th season with BSC. Julie started coaching at the Academy level, and has been at the Junior level since 2015. She has assisted with the current 14U Girls Blue team since 2015, in addition to coaching the 11U Girls Blue team last year. Player: Julie played HS soccer with William Fremd High School (IL) and club soccer with Sockers FC (IL). 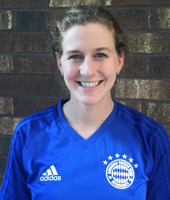 Coach: In addition to coaching with BSC, Julie coached the Freshman Girls team at Whitefish Bay High School from 2009 to 2011, was the Assistant Varsity Girls Coach at Pekin Community High School (IL) in 2012, and was the Assistant Varsity Girls Coach at Whitefish Bay High School in 2013. Julie holds an D License. Personal: Julie is originally from Palatine, IL and moved to Milwaukee to attend Marquette University. Julie rowed at Marquette University for two years before heading to Whitefish Bay High School to start her coaching career. She currently works as an insurance underwriter and holds a BS in Mathematics and a MBA. Bavarian: Coach Rosenthal is entering his 3rd year with Bavarians.He has worked in the Bavarian Academy for two years with 8's and 10's and assisted with the Bavarian U18's in 2017. Player: Played at UWM from 2007-2010, as a 3 year captain. Professional career 3 years in Uppsala and Stockholm Sweden. Gamla Upsala Sport Klub, and Valsta Syrianska IK were the two clubs. , and Played for Team Wellington in the New Zealand ASB Premiership. Coach: Greg worked at Ole Football Academy in New Zeal. Additionally, he was an assistant coach of Team Wellington's champiagn in the 2015 OFC Champions League in Suva, Fiji. Personal: Coach Rosenthal is originally from St. Paul Minnesota. Bavarian: Nikola begins his 2nd season with BSC. He played for Bavarian from U16-18 under Jesse Rosen. Personal: Coach Savic graduated from UW-Milwaukee with a bachelor's degree in Information Technology Management. Bavarian: Coach Scalici joined the BSC coaching staff in 2013 working with the 14U Girls White team. Player: Sal has over 25 years of playing experience with the Whitefish Bay Soccer Club, Verdi Soccer Club and our Bavarian Soccer Club. Coach: Prior to BSC, Sal spent 6 years as the Director of Coaching for Whitefish Bay Soccer club. In addition to coaching U11-U18 club soccer, Sal also coached both boys and girls High School Soccer. Coach Scalici currently holds a USSF National "D" license as well as a NSCAA Professional Development Certificate and an American Sports Education Program Certificate. Bavarian: This is Coach Sperl's first year with Bavarian. Player: Coach Sperl played High School soccer with Wauwatosa West. Nicole played club soccer with FC Milwaukee and went on to play collegiate soccer at UW-Milwaukee (2007-2010) and contributed to four Horizon League Conference championships. Nicole’s individual accomplishments include Horizon League All-Newcomer team (2007), National Soccer Coaches Association of America All-Region First Team (2008), All-Horizon League Second Team (2009), All-Horizon League First Team (2010), NSCAA All-Region Third Team (2010) and Horizon League Defensive Player of the Year. Coach: In addition to coaching with BSC, Nicole is in her 3rd year at Mount Mary University. Coach Sperl holds her USSF National "D" License. Bavarian: Kelly begins her 5th season with BSC. Kelly had been the head coach of the 10U Girls White team since the spring of 2014. Player: Coach McGrath played High School soccer with Wisconsin Lutheran High School, club soccer with FC Milwaukee and college soccer at UW-Milwaukee (2007-2010). 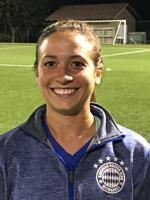 Coach: In addition to coaching with BSC, Kelly has also coached with her alma-mater Wisconsin Lutheran High School's JV team as well as with Milwaukee Sport Club. Coach McGrath holds her USSF "E" License. Personal: She enjoys spending time up north boating with friends and family. Bavarian: This is Coach Stemmeler's first year with Bavarian. Player: Growing up, Ashley played for FC Milwaukee from U11 to U23. She played at Marquette University from 2009-2013 and contributed to five Big East Conference Championships, two Big East Tournament Championships (2012, 2013), and five NCAA tournament appearances with Sweet 16 appearances in 2010 and 2012. Coach Stemmeler was named a captain my senior year. Coach: In addition to coaching with BSC, Ashley coached at St. Joseph Catholic Academy in Kenosha. Personal: Coach Stemmeler grew up in Thiensville, WI. She is a First Grade teacher at Dunwiddie Elementary School in Port Washington and also currently coaches girls basketball at Homestead High School. Bavarian: This is Coach Swihart's first year with Bavarian. He will be an assistant coach in the Game Model program focusing on the 11U, 12U and 14U Boys. Player: Coach Jacob was a 4 year starter at Concordia University of Wisconsin, won 2 conference championships during career there, including their first conference championship in 12 years. .
Coach: Coach Swihart is in the process of earning his USSF National "D" License. Personal: Jacob hails from Sheboygan and is a massive, massive Manchester United supporter. Bavarian: Coach Weisse is in 6th season with Bavarian Soccer Club having started in November of 2011. Player: Coach Weisse played club soccer with the Oshkosh Youth Soccer Club from 1984 - 1993. He also played with Oshkosh North High School from 1990 to 1993. After high school he continued his playing career at York College in Nebraska from 1994-1996 and in 1998. After his collegiate career he played Majors soccer with the Cruz Azul Majors Team in Bakersfield, CA from 1999-2001 and Mequon United's Majors Team from 2003 through 2007. Brian continues to play over 30 soccer both indoor and outdoor. 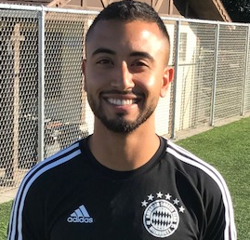 Coach: Prior to working with Bavarian Soccer, Brian coached 2 years with West Bakersfield High School in CA, including the last year as the head coach. Brian coached 9 years with the Nicolet High School boys program with the last 3 years as head coach and 8 years with their girls program (mostly as a varsity assistant).Coach Weisse currently holds a USSF "B" License.